The “Spotted Dove”, also known as the Ground Dove, is a small bird native to the deserts of the American Southwest and nests in mesquite and saguaro cactus. 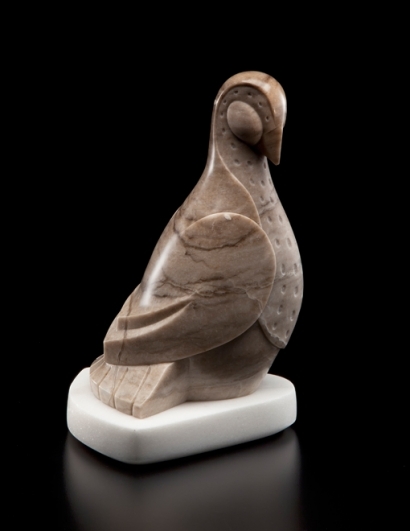 The spots on this little dove (only 6 inches tall) are the beautiful graphic pattern which inspires this stone sculpture. The lines of a dove are continuous curves and I enjoy sculpting this combination of broad curved surfaces, crisp edges, and raised plains. The stone is Brown Alabaster from Mexico–appropriate for this little desert-dweller.